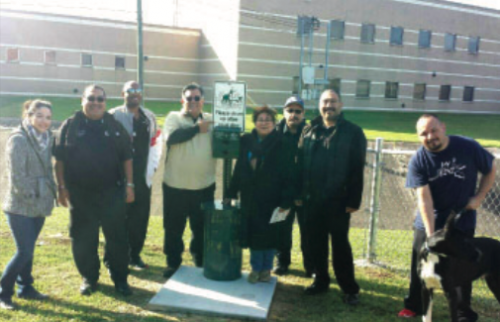 The City of Galena Park Dog Park was officially opened this past Saturday morning, Jan. 9th. This was made possible by the city’s Parks and Recreation department and volunteers from LyondellBassell. Pictured at the dedication are Parks & Recreation Director Ernesto Paredes, Olivia Paredes, Councilpersons Cruz Hinojosa, Marisela Serna, Juan Flores, and representatives of LyondellBasell. The dog park is open to the public daily, on Keene Street. GALENA PARK – At the CIP meeting held last week at the Baggett Center, attendees learned about Environmental Controls at a typical Gulf Coast refinery or plant. They also heard from a representative of SunEdison Pasadena, Erik Pitoniak, that his company was “starting the process of de-inventorying the facility” with the goal of shutting down now, and able to restart in the future. Pitoniak indicated that long term plans were being evaluated. 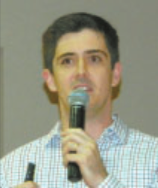 Other speakers, who detailed steps in their environmental programs, included Roel Munoz of LyondellBasell, and Tony Bundick of Kinder Morgan. A plant safety program was presented by a representative from Shell Lubricants. Shell has 180 employees at their facility on Clinton Drive in Galena Park. 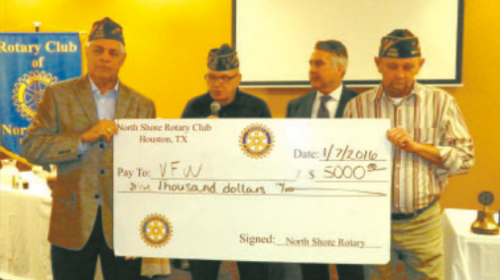 AT THEIR RECENT luncheon meeting, the North Shore Rotary Club made a donation to the VFW of $5000, to renovate their hall in Cloverleaf and bring it up to ADA handicap standard.